OKLAHOMA CITY — Lisa House always told her son Danuel to never give up hope until the clock hit zero, zero, zero. But that doesn’t count when your team trails by 12 with 34 seconds remaining, does it? Because that game is over. Isn’t it? Before House had even made his first field goal, Aggies guard Admon Gilder put back an Alex Caruso miss with 33 seconds remaining to cut Northern Iowa’s lead to 10. Double digits in 33 seconds? Forget it. House made his first field goal with 25.8 seconds remaining in regulation. After that layup dropped, the deficit in the most mind-bending comeback in NCAA tournament history fell to eight points. Eight points in 25.8 seconds? Impossible. The Aggies pressed again. Northern Iowa’s Paul Jesperson caught the inbound. 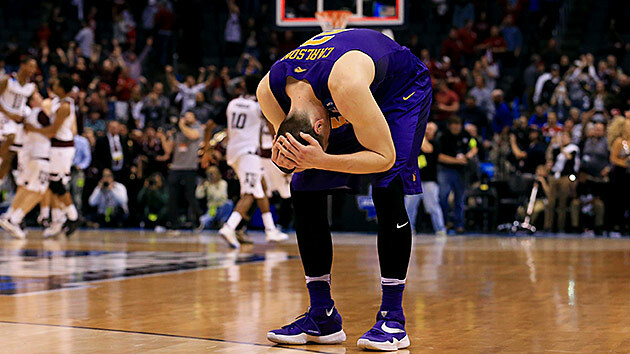 Jesperson, less than 48 hours removed from a half-court buzzer beater to sink Texas, tried to bounce the ball off Texas A&M’s Tonny Trocha-Morelos and out of bounds. Trocha-Morelos dodged. Aggies forward Jalen Jones grabbed the ball and dunked it. Six. In 21.7 seconds? No way. Then the Panthers’ Wyatt Lohaus threw the inbound across the sideline and out of bounds. Alex Caruso then hit House, who drained a three-pointer from the wing. Three points. In 19.6 seconds? O.K. This might happen. Jesperson, one of the players who befriended Northern Iowa alumnus Kurt Warner during these past two seasons, did his best Warner impression. The Panthers finally broke the press when center Klint Carlson ran a go route, hauled in Jesperson’s pass and dunked it. Five points. In 17.9 seconds. Crisis averted. Texas A&M’s Caruso took the inbound, dribbled the length of the floor and bore down on Jesperson. Just before the right block, Caruso darted left. Caruso figured Jesperson would expect him to use his left hand, so he kept the ball in his right. Caruso would surmise later that had he chosen his left, Jesperson never would have touched the hand that held the ball. Instead, Jesperson’s right arm collided with Caruso’s right arm just as Caruso let the ball go. A whistle blew as it fell through the net. Foul. And-one. Caruso made the free throw. Two points. In 11.8 seconds? The Aggies still needed a miracle. The same two words thundered in the head of Trocha-Morelos. Don’t foul. Don’t foul. Truth be told, he was shocked to be playing. Aggies coach Billy Kennedy had yanked Trocha-Morelos earlier because he couldn’t guard Carlson, a 6'7" stretch four who played the five much of the weekend so he could befuddle centers from the top of the key. But here came Trocha-Morelos and Gilder, closing in on Northern Iowa senior Wes Washpun, the man with the best handle of anyone on the court. Washpun, who makes magic when he dribbles, never dribbled. Trocha-Morelos and Gilder raised their arms and quickly sucked out all the oxygen. Washpun tried to curl around Gilder but gave up when he saw the sideline. He then leaned back toward the end line. He had no timeouts. He couldn’t pull a Chris Webber. But with six seconds remaining, he had an idea. For the rest of his life, Washpun probably will wonder, What if he’d simply held the ball? He hadn’t yet dribbled, and since there is no longer a rule against keeping the ball for more than five seconds while dribbling under close guard, he might have been able to stretch his time had he found some open floor. Or what if he’d chucked it? He certainly could have thrown the ball to the other end of the court. It probably would have been grabbed by an Aggie or gone out of bounds, but Texas A&M would have had to travel the length of the court and score. Washpun didn’t do either of those things. Like Jesperson earlier, he tried to bounce the ball off a defender and out of bounds. Sensing Washpun’s desperation, Trocha-Morelos jumped away. The ball bounced once and landed in Gilder’s hands. Gilder dribbled once and went up and under Jesperson for a layup. Tie game. With 1.8 seconds remaining. Holy mackerel. House had no idea at first that Gilder’s layup had pulled the Aggies even. Neither did Trocha-Morelos. Only when the players saw their coaches waving them back toward the other basket did they realize what had happened. And then they remembered Texas. Hadn’t Northern Iowa just won on a half-court shot? That would never happen twice. Would it? Hell, scoring 14 points in 33 seconds never happens, either. So House put up his hands and repeated to himself, Not the Texas game. Not the Texas game. Washpun’s heave hit high on the backboard and fell to the ground. It is a testament to the resiliency of the Panthers that it took the Aggies two overtimes to turn the most mind-bending comeback in NCAA tournament history into a 92–88 win. By the time it was over, Washpun had fouled out. So had Jesperson, who had a chance at another half-court game-winner at the end of the first overtime. Texas A&M will go on to face Oklahoma in the Sweet 16 in Anaheim, Calif. The Panthers will return to Cedar Falls, Iowa, acutely aware of how close they came. “It felt like we were a minute away from dancing,” Jesperson said. To a man, the Aggies heaped praise on Northern Iowa. Some amazing things that had never been pulled off before and may never be pulled off again. Even after two overtimes and a celebration that left attendants warning of copious amounts of water-bucket ice on the Texas A&M locker room floor, they still weren’t sure exactly what they’d done or how they’d done it. During and after the comeback, House heard his mother’s words echoing in his head. House has a daughter of his own. Her name is Ava. She’s too young now, but the moment she begins playing sports, her dad knows exactly what he’ll tell her.